The XRE Transcoder 9 is a standalone conversion solution that enables broadcasters and media companies to automate the transcoding of media files, using watch folders that can be placed anywhere on a network. Transcoding is fully optimized to the host machine’s specifications and is faster than real-time in many cases. Supplied as software or a full turnkey system and connected via Ethernet, XRE Transcoder 9 gives editors in a workgroup the freedom to spend their time editing, not transcoding, and supports the extensive list of formats and codecs that has made EDIUS such a force in broadcast news production. 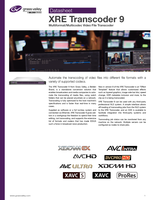 And the XRE Transcoder 9 can be used with any third-party professional NLE system. XRE Transcoder 9 software. Includes XRE server software and transcoder application. XRE Transcoder 9 software server. Deployed on Dell R630 server; includes XRE server software and XRE Transcoder 9 application. XRE Transcoder software site license (1 year). One year site license to receive free upgrades during the contract period. Does not include hardware upgrades/support or software support. *Certified for HP Z840 workstation or Dell R630 server only.